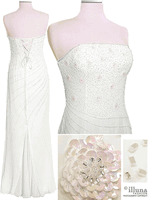 Bridal Dress Chiffon Swirling Crystal Beaded Strapless - Lovely destination bridal gown with sequin mini-rosettes on the bodice; scattered beadwork throughout in swirling pattern for ballroom dance style. Perfect for resort prom or evening. Has godet hemline with sewn-in liner. Dramatic low back silouette with lace-up and zipper. Lace-up back for custom fit.